This post is not going to be about what BDD / Specification by example is and the benefits of it but more of a quick start with doing UI-testing in a SpecFlow manner. 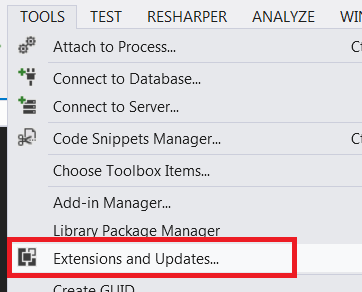 Although it’s not technically necessary I’d advice you to add the SpecFlow extension to Visual Studio. This is added through TOOLS / Extensions and Updates. A feature is something we use to describe what we’re about to test and why. Since we’ve installed the SpecFlow extension we can simple add a new feature by adding a new item and select the SpecFlow Feature file. Since we’re going to continue with our header test let’s call it Header.feature. In our case of the header it’s likely that it does more than simply indicate the current active page so in real life we’d probably have more than the one scenario we’re going to focus on in this example. Given I am on the page "/"
Then the active link in the header should say "Start"
When I am on the page "/Alloy-Plan"
Then the active link in the header should say "Alloy Plan"
There’s much to be said about how the descriptions and scenarios should be formatted but since that’s a bit of a rabbit hole and (at least) a post in its own I’m gonna say “Look behind you, a three-headed monkey!” and get on with it. In the window opening we can preview the missing steps SpecFlow found as well as some other options we can ignore for now. Click generate and save the file somewhere in your project. Let’s dissect the Given method to see what’s going on here. The method is marked with a attribute containing a keyword (Given in this case) and a regular expression. This regexp is used to match what is written in the feature file. SpecFlow was also clever enough to realize that what we typed inside the quotation marks (an url in this case) is probably going to be used as a parameter for the test. This is captured in a group in the regexp and then sent to the method as the (generated) parameter p0. When SpecFlow executes the step ‘Given I am on the page “/”‘ it will find a method marked with an attribute that matches that regexp (GivenIAmOnThePage) and then use the group in the regexp to give the parameter p0 the value of “/”. We’ll make use of the SeleniumServer class from the previous post and as usual we’ll need both the Nunit and the Selenium.WebDriver package. 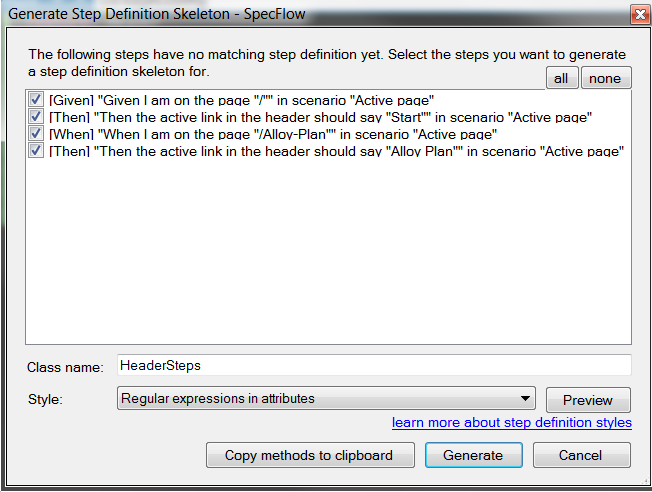 We’ll also add the NUnit for SpecFlow package so that we can use NUnit for asserts in the steps. Previously we used NUnit hooks to open and close the browser before any test is run and after all tests are run as well as clearing cookies between tests. SpecFlow also contains these type of hooks and they are implemented by adding the Binding attribute to a class and then implement methods that are decorated with one of the hooks attributes. With that infrastructure in place we can finally implement the steps and also refactor the parameter names a bit for clarity. This concludes our first look at SpecFlow and UI-testing. While I haven’t touched upon the subject in detail in this series of post there are ways to mitigate code duplication and page layout details leaking into your test code. One such way is using the Page Object pattern. During the last years I (and the rest of the team) used Cucumber I liked how the gherkin language tied into UI-testing and at times it can be useful almost in the same manner as a page object but on a different level of abstraction. It might not be very clear in this introduction post but hopefully I can come back later and elaborate more on this subject.